If I'm honest, prayer is hard for me. It's hard on a few different levels. On one level, it has to do with the anxiety and OCD that I struggle with. But on another level, I often find myself feeling that either 1.) I need to fix myself before I approach God, or 2.) that God can't relate to my struggle and that He won't have compassion on me. Both of these things are lies, and deep down, I know that. But sometimes, we all need a bit of a reminder, right? My reminder came when I was at a women's bible study a few days ago. It came from Hebrews 4:4-16 and the discussion that followed. Honestly though, can Jesus relate to our struggles, really? He is God, so wouldn't he be able to just "go through it all" without feeling the real pain of everything he suffered? These are questions our bible study leader addressed, and they are questions I've definitely asked myself more than once. 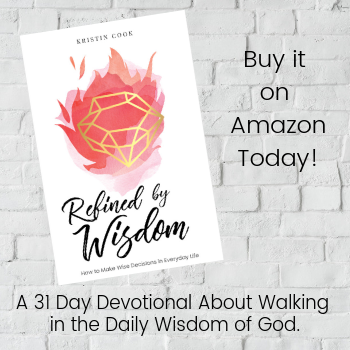 But the truth is that though Jesus could have skated through his earthly life, only feeling what he wanted to feel and only experiencing the good parts of life, that just isn't what happened. Jesus was mocked/ridiculed (Matthew 27:27-31). Jesus was misunderstood by his disciples (Mark 8:14-21). Jesus was misunderstood by the world around him (Mark 14:53-65). Jesus knew what true starvation felt like (Matthew 4:1-4). Jesus knew what sorrow felt like (John 11:28-37). Those examples are only the tip of the iceberg when it comes to what Jesus experienced and what he understands, but you get the point. Jesus can sympathize with me, and that is a beautiful thing. However, going to God with confidence is more than just knowing that Jesus can relate. There's more to it than that. There are two parts to this. Yes, Jesus is able to sympathize with our weaknesses because he went through what we've gone through (and then some). However, Jesus is also divine, sinless, and holy, and that's the reason he is able to save us. Had he not come to earth as a human, he wouldn't have been able to offer himself as our sacrifice, and if he had not lived a sinless life through his divine nature, he would have been a blemished, imperfect sacrifice, and it would have failed. But because he can both relate to us and was, in fact human, yet he never sinned, Jesus is the only perfect sacrifice. He is both holy and merciful; perfect and compassionate towards our weakness. And as we stand before God- with Jesus' sacrifice and perfection being imparted to us- we can stand with confidence. He loves us. When he looks at us he no longer sees our sins. 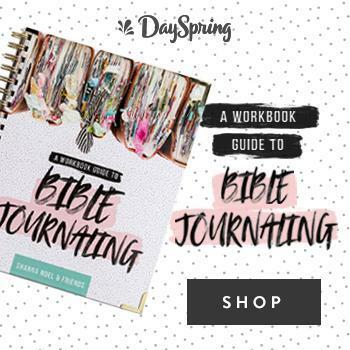 Instead, he sees the radiance of Jesus shining through us, because our sins have already been covered and paid for through Jesus' death and resurrection. 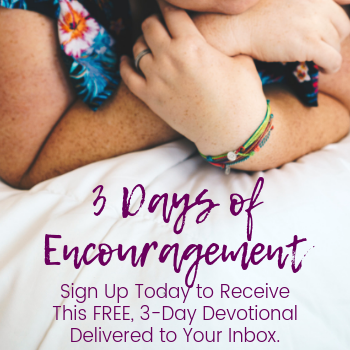 It's hard to imagine and difficult to believe because it is such an indescribable gift, but believing in that gift is exactly what gives us the right to approach God with such confidence. How amazing is that?! 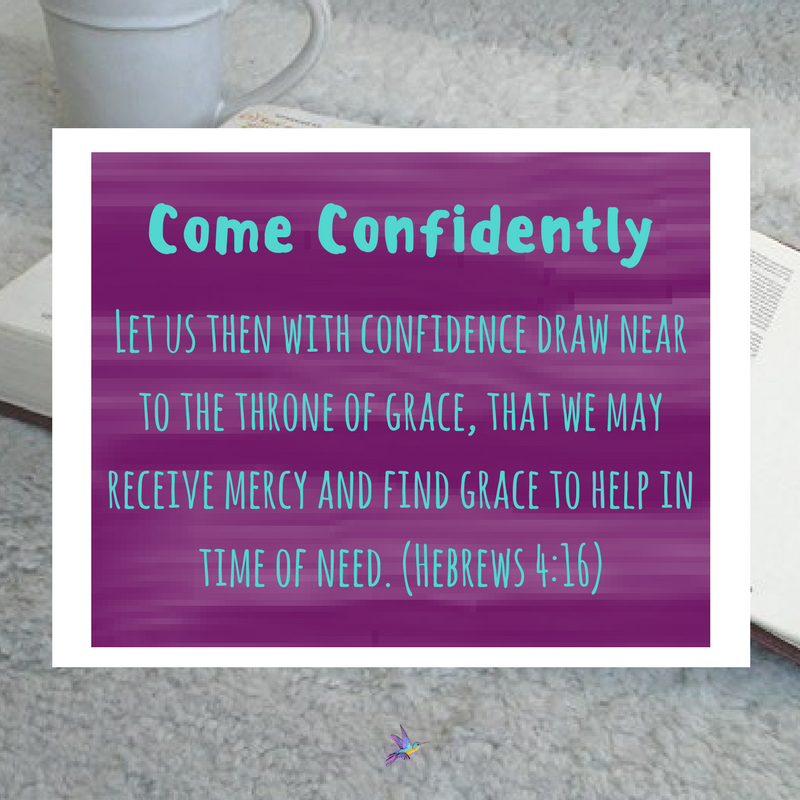 So when God says in Hebrews 4 to approach him with confidence, he means it. We don't have to fear God, fear judgement, or fear death. We are covered in the blood of Jesus, which means we are covered in his righteousness. And God was the one who wanted us to have that gift in the first place. 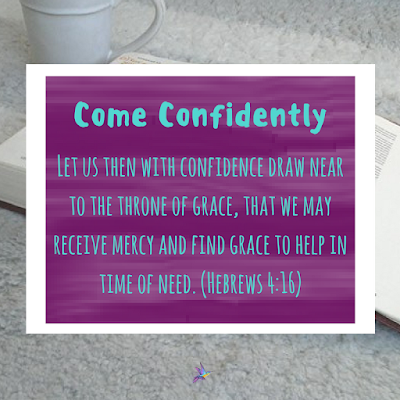 He wants us to be able to approach him and he wants us to come to him with confidence, ready to receive his grace and his mercy. He is a great, great God. So from now on, when we pray, let's remember the confidence that God intends for us to have. Let's remember to come boldly, ready to receive his grace and mercy, and lets give thanks for the perfect Savior who made it all possible. 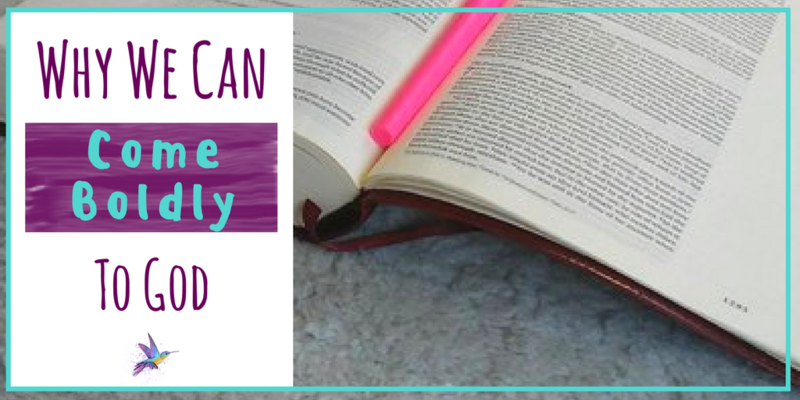 This post is in collaboration with Blogging Through The Bible: A link-up all about getting into God's word and building community. You can find the linkup at The Speckled Goat.